DNV GL’s annual survey finds executives optimistic about the prospects for gas in the coming year, but thereafter, the picture becomes a little greyer. Includes interview with Liv Hovem. International oil companies face a challenging year, according to new research by global quality assurance and risk management company, DNV GL It shows that business leaders expect the industry to commit to greater investment to meet hydrocarbon demand. But the proportion of industry leaders who expect to raise or sustain operating expenditure has also grown over the two-year period, from 41% in 2017 to 65% for 2019, suggesting that cost-cutting is no longer possible. Exactly two-thirds (67%) of senior oil and gas professionals believe more large, capital-intensive oil and gas projects will be approved this year, according to A test of resilience, DNV GL’s ninth annual report on the outlook for the oil and gas industry. And a slightly larger percentage plans to increase or maintain capital expenditure in 2019 – nearly double that of 2017’s figure of 39%. All the regions – North America, Latin America, Europe, Middle East/North Africa and Asia Pacific – inspired greater investor confidence in this year's survey than they did in last year's, but with wide differences: for example, Europe was only 2 percentage points brighter at 70% than it had been the year before, and this year it was the lowest of the lot. There may be a correlation between that, and the region’s declining oil and gas output, especially in the Netherlands with only the UK bucking some downward trends, and Norway’s latest licensing round breaking some short-term records. Both have seen upstream merger activity, itself a sign of life as long as the prices reflect big premiums. UK industry group Oil & Gas UK commented that the report “builds on our analysis showing the positive future ahead if we continue to strive towards Vision 2035. We cannot afford to return to a position of cost escalation and instability seen previously. North America and Africa meanwhile are on the brink of a series of final investment decisions that are needed to propel pipeline gas and more LNG into the energy supply gap early next decade. And a clear majority (57%) of respondents believed that oil and gas companies will be able to achieve high profitability over the next decade – a large rise from 45% a year ago. Levels of optimism differ by region, but the overall trajectory is the same, the report says. 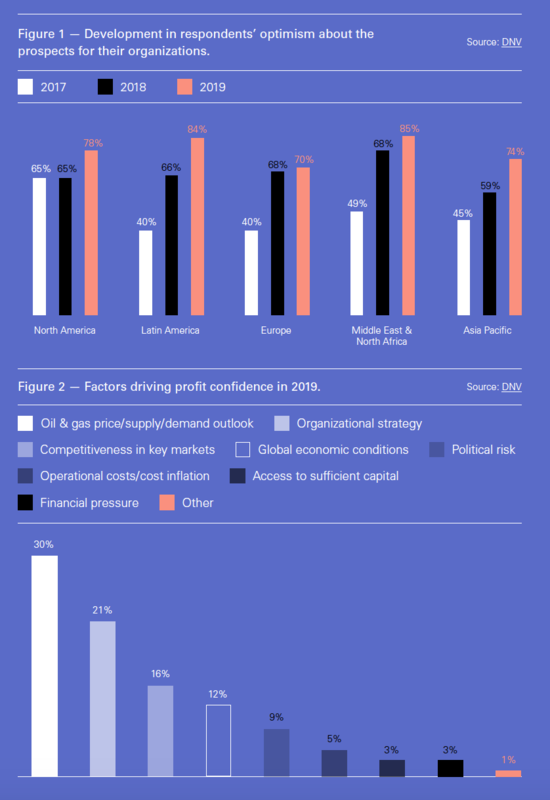 While regional reasons for pessimism exist, there are some concerns common to all areas surveyed: "Competitive pressure now ranks as the biggest expected barrier globally in 2019, unseating the price of oil, which has topped the list of worries for the past five years. These top two issues are closely followed by the global economy. A third (34%) of the 791 senior professionals surveyed expect to grow their workforce in 2019 – more than three times as many respondents than four years ago (10%). But at the same time, the pool of talent is not growing. Young engineers are not generally attracted to the upstream industry, perhaps believing that its days are numbered, and going into other branches of technology instead. “The global oil and gas industry is entering 2019 with renewed optimism and a greater sense of resilience. 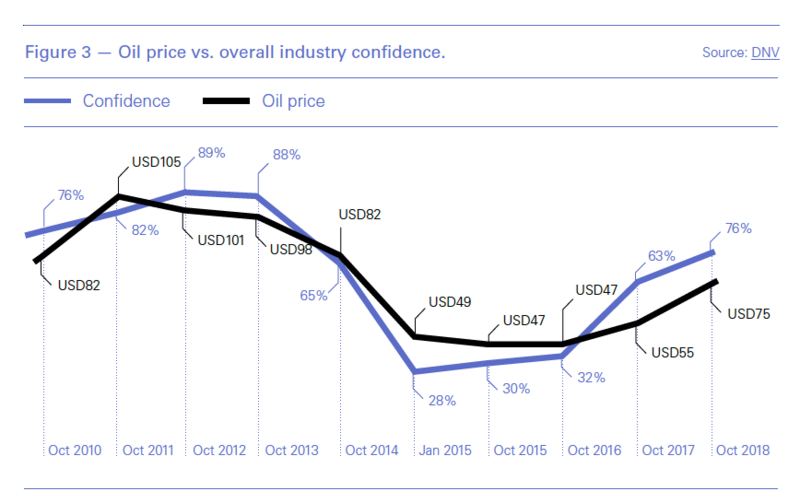 Despite greater oil price volatility in recent months, our research shows that the sector appears confident in its ability to better cope with market instability and long-term lower oil and gas prices. For the most part, industry leaders now appear to be positive that growth can be achieved after several difficult years,” said the head of DNV GL's oil and gas division, Liv Hovem. In an interview with NGW after the report was published, Hovem said 76% of the (nearly) 800 senior oil and gas professionals who we surveyed said they are optimistic about the outlook for 2019. That is the exact same percentage that we reported when we started the research in 2011. The average oil price over the past few months also is broadly similar to that time; just before it rocketed to more than $100/barrel, took a nose dive in 2014, and then started to recover in the past year or so. Confidence in the outlook for the industry may be back to the levels we observed in the pre-boom and bust era, but it is clear that today’s market looks very different compared with 2011. Companies are faced with a far more volatile landscape today – the sudden drop in oil price back in November last year is testament to that. But the survey is not open-ended: it confines itself to the respondents’ view of the year ahead and so respondents might have different view if we look further ahead. The major FIDs for gas, starting with LNG Canada last year and expected to continue into this year and next, have created a more positive outlook in the market. On the other hand, growing energy efficiency, the drive to achieve the Paris Agreement and the energy transition generally implies oil will have a smaller role to play than it does now with each succeeding year. DNV GL research shows that it will be possible for an electric car and a diesel car to cost the same to buy and run by 2024 – the same year we see as peak oil demand. We have a strong belief in the electrification of buses and cars, if not aviation and heavy-duty transport for which biofuels and LNG will prevail. On the other hand it is positive for gas, not only for LNG, for which a number of multi-billion final investment decisions are planned for this year, but also as a source of hydrogen. Decarbonisation of gas grids could initially be achieved with hydrogen generated by conversion of natural gas to hydrogen with carbon capture and storage (CCS) equipped auto thermal or steam methane reforming which may then be injected into the grid or liquefied for use elsewhere. Hydrogen connects the uptake of renewables with the oil and gas industry, as the same infrastructure can be used. DNV GL is working on the safety aspect of blending hydrogen within current gas networks. Hydrogen can be separated from carbon both offshore and onshore, and with investment the cost of doing this will fall, as we saw with renewables. Gas is going to receive more investment than oil in the medium term, which it will overtake, it will be the single most important energy source by 2050, accounting for a quarter of the global mix. Gas demand is expected to peak in 2034, but plenty of backfilling will be needed. The research was done late enough to account for the fall in oil prices in November but the industry is in a much better position to cope with the price and prepared to tackle volatility as prices change. Oil producers are making bigger margins now than they were when oil price was higher, thanks to the implemented cost efficiencies during the down-turn. But the same is not true for the supply chain, from whose perspective the risks and rewards are not yet balanced, she said. Confidence in the future growth of the gas market is sparking investment activity among industry participants, the report says: “For many industry participants, a standout example of what might come was the multi-billion-dollar final investment decision (FID) in October for the LNG Canada project in British Columbia. FIDs for gas projects have picked up pace in Australia. US major Chevron gave the green light to invest $5.1bn in an expansion of the Gorgon project in April 2018, and in December ExxonMobil committed to the West Barracouta gas project. And in October, Australian independent oil and gas company Woodside awarded a front-end engineering and design contract to Bechtel to advance a second LNG train at Pluto LNG on the Burrup Peninsula, with FID slated for 2020. Predicted growth in gas demand is also driving midstream infrastructure projects, including several LNG mega projects such as the fourth LNG train in Qatar and as the world’s biggest oil producer the Middle East continues to draw investment in oil. Abu Dhabi National Oil Company (ADNOC) announced a large spending programme of $132bn between 2019 and 2023 to boost oil production, and develop the country’s gas resources and associated downstream segments. The latter will see an allocation of $45bn to expand the Ruwais petrochemicals complex.